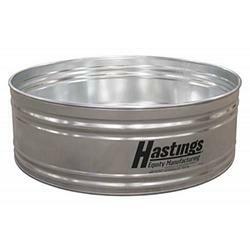 The Hastings 20GA Black Label steel round stock tank (4' x 2') has been the industry standard for decades. It is one of the few tanks on the market still made out of all 20GA, G90 steel. We know that producers need reliable, long term infrastructure and that cheap won't cut it. Other manufactures use cheaper materials and avoid talking about their warranties on stock tanks, but we are proud to promote our industry leading 5 year warranty on our Black Label tanks. Other features include: 4-ply lock seams with contained sealant for maximum leak protection, .875" steel pipe rolled into the top of each tank to create a crush proof rim (HD1102 has a 1.5" angle iron top), long lasting zinc plated .75" one piece threaded plug assembly (HD1102 uses the two piece 2152 plug), largest selection of sizes available to meet your needs.